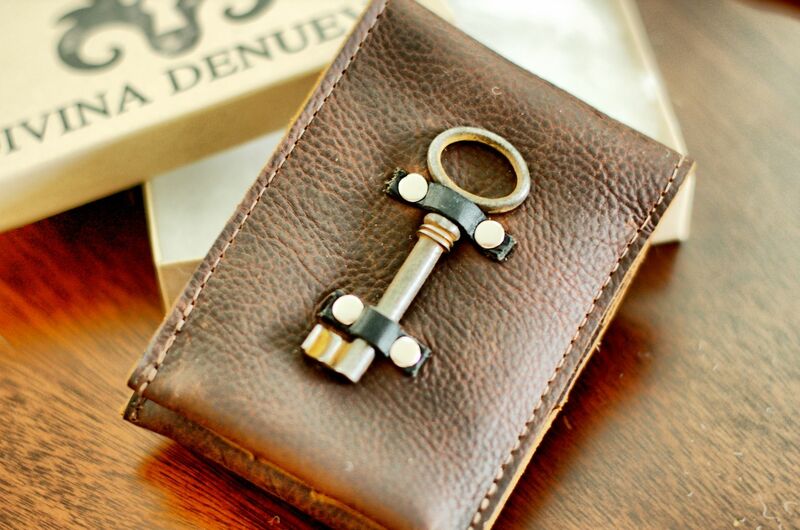 Divina Denuevo's Lucera Phone Wallet is made using durable oil tanned leather that ages beautifully and remains supple to the touch. It's the ultimate wallet – with room for cash, cards, your phone and change. Embellished with an authentic antique skeleton key, this original case is a true statement piece. It features one large phone pocket, 3 card slots, an additional pocket for cash, and a coin pocket with a snap closure, all stitched with industrial grade nylon thread in a unique angled design. Each card slot can fit at least 3 cards. Each case will have its own, unique key – making no two cases the same. Keys are silver-toned. Leather accents that hold the key in place are black in all cases EXCEPT the black case, where they are brown.